Throughout each year Health Quest Therapy engages in events and activities that bring us closer to the people and community we love. The 2018 HOLIDAY FOOD BASKET GIVE-A-WAY WAS A SUCCESS! Thanks to the amazing Patients, Employees, and Friends of Health Quest Therapy for their extraordinary generosity during this holiday season. Your generosity made it possible for HQT to deliver 3 complete holiday meals to deserving families throughout the area. In addition, your generous support provided an additional hundred plus pounds of non-perishable food for the Talkeetna Food Bank. Health Quest Therapy sponsors Willow musher Wade Marrs for 2019 season. Wade Marrs is an extraordinary dog musher and an all-around good guy, who is working hard to make his dream of winning the Iditarod come true while bringing national attention to people living with Turner Syndrome. This will be Wades 8th start and we wish him good luck and safe and speedy trails. 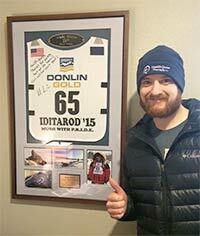 It’s been an amazing journey for the Knik native who began his competitive mushing career in 2007 when he ran his first Jr. Iditarod. 12 Years and thousands of sledding miles behind him, Wade is looking forward to the 2019 season. Follow along with us this season, we have no doubt it will be exciting. As Wade Marrs and Stump Jumpin’ Kennel, once again, begin their quest to be first into Nome. Download the 2019 course map and follow Wade and the team as they race to Nome! Become part of the team, while supporting Wade Marrs and the Stump Jumpin' Kennel with the purchase of quality logo wear and accessories.